Submitted by JournalistKathy... on Tue, 10/04/2011 - 20:21. 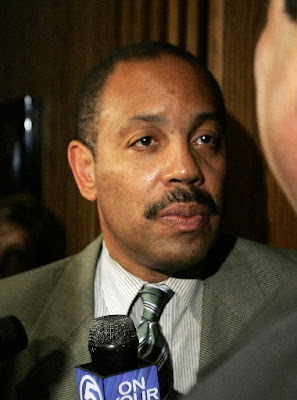 Former Cuyahoga County Court of Common Pleas Judge Steven Terry, who was one of two Black men and three Blacks on the county's 34-member common pleas bench, was sentenced Tue. 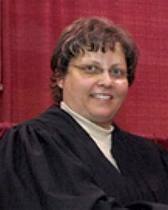 by U.S. District Court Judge Sara Lioi of Akron to the maximum sentence of 63-months in prison, causing outcries of racism in greater Cleveland's Black community since former Cuyahoga County Judge Bridget McCafferty, who is White and also convicted of crimes in office, only got 14 months from the judge, though she faced 50 years in prison. "I'm so upset," said Ada Averyhart, 77, a longtime community activist. "He's a Black man and she is a White woman and he has never got in trouble and got caught up. They are trying to get all of our Black men, especially those that are educated." Art McKoy, the city's most prominent community activist and the founder of Black on Black Crime Inc., agreed, but he had harsher words. 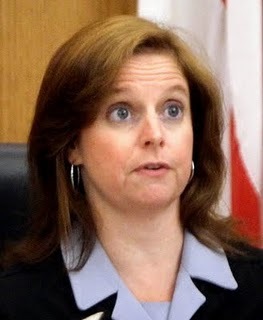 "In the early 1900's it was known that White justice was unfair when comparing a Black man to a White one and here we are in the year 2011 and one only needs to look at the sentencing of Judge Terry in comparison to Judge McCafferty to see the disparities and to know that the system is still as racist as ever," said McKoy. "Research acknowledged by the Cleveland NAACP reveals that Black men are unfairly prosecuted and sentenced in Cuyahoga County in comparison to Whites and I can only hope there is more outcry around this." McCafferty, 45, has already reported to prison after a jury convicted her of 10 counts of lying to FBI agents on whether she was involved in case fixing with former County Auditor Frank Russo and former Cuyahoga County Commissioner Jimmy Dimora, who was also chairman of the Cuyahoga County Democratic Party. Convicted also of corruption related crimes, Russo faces 21 years in prison after he finishes snitching on fellow Democrats and Dimora awaits trial on some 28 corruption-related charges, including racketeering. Terry, 53, who took the stand at trial and denoed the charges, was convicted in June by an Akron federal jury of three corruption- related charges for allegedly fixing a single foreclosure case against a popular and rich mortgage company for Russo. After the judge issued the sentence on Tue, Terry thanked his family and friends and vowed to appeal. He left the courtroom accompanied by his lawyer, Sylvester Summers. Amy Hurd, who is active in politics and has campaigned on voter registration issues and for now president Barack Obama, was also angry over the disparate sentencing activity by Lioi. "This is strictly a racial issue and another crime against a Black man," she said. Lioi must now decide if Terry can remain free pending appeal, an unlikely gesture, some say, since the favored McCafferty was denied a similar request. Reach Journalist Kathy Wray Coleman at www.kathywraycolemanonlinenewsblog.com, ktcoleman8 [at] aol [dot] com and phone number: 216-932-3114. Submitted by lmcshane on Wed, 10/05/2011 - 06:12. She gets the puppy dog sentence...because she is a woman and because she has an Irish name. It is wrong. Submitted by JournalistKathy... on Wed, 10/05/2011 - 10:24. That's what others think too. Submitted by lmcshane on Wed, 10/05/2011 - 19:41. UNREAL--in the regular mail yesterday--I got my Martin Sweeney and other future felons endorsement of McLaughlin Murray who somehow this time around got excellent on Judge4yourself, when in the past she did not AND I got a request to support the Western Reserve Land Conservancy. For those who don't know it--Rokakis is now fed non-profit monies through the Western Reserve Land Conservancy. Submitted by JournalistKathy... on Wed, 10/05/2011 - 22:28. Judge McLaughlin Murray and Administrative and Presding Judge Ron Adrine, and Clerk Turner, are dangerous to the administration of justice.